Edited by Douglas and Marcelle V. Brown. A review by a non-Ugandan DO of this Uganda-centric book calls for an explanation before the editor or the reviewer is lynched either at the next reunion of the Uganda Kobs or else by that unusually large group of Ugandan DOs now resident in Australia. The editor's rationale in passing the book to me was characteristically crisp. Of the approximately 120 District Officers on the p. and p. establishment of the Protectorate administration at independence in 1962, three-quarters were still living thirty years later. Of these, over half have contributed to this volume. Thus he felt that the chances would be high that an ex-Ugandan DO from the OSPA membership list approached to review the book would turn out to be one of the present contributors. That, we agreed, might be rather like inviting a serving DO to write an annual confidential report on his Governor. My own enthusiasm for the assignment rests on the fact that for one who is deeply involved in researching the history of the District Officer in Africa, here would be an opportunity to view the publication from a wider than territorial perspective, namely as a contribution towards the history of the men and women of the Colonial Service and its successor HMOCS. So, first the book, and then its context. What is it we are offered by the Browns' admirable initiative? The essential answer lies in the unqualified sub-title: 'Recollections of District Officers'. In turn, this was prompted by the contributors' need to respond to the editors' basic enquiry "What did you do in Uganda?" The outcome is the reply of over sixty members of the Uganda Administration or their wives to that fundamental question. But this is prose, continuous, coherent and compelling, not filling in some door-to-door consumer survey questionnaire or Reader's Digest technique of 'tick one box'. These ninety-odd mini-essays (several writers have more than one contribution) were then classified by D. and M. Brown, usefully both qualified lawyers, into a number of thematic categories: Up-Country Stations, Central Government and Secretariat, On Safari, Projects and Assignments, Visits and Visitors, Uhuru, and so on. All focus on the Protectorate years (1894-1962), though in the event only a couple of recollections predate 1946. Appropriately there is a whole section on the Kingdom of Buganda and the Kabaka's turning-point deportation. The book concludes with three sections on post-colonial Uganda: Staying on. Revisiting and Reflections. The shortest recollection is one page; the longest, twenty; and the median, three to four pages - and at almost 600 words a page these are no snapshot snippets. We are dealing with some 225,000 words in all, two or three 'normal' books! Each contributor writes quite personally and narratively, freed from heavy editorial intervention or pedantic commentary (I for one would like to have seen such successful editorial guidelines reproduced as an Appendix). To a prominent extent, the impressive nature of this collection of reminiscences lies in the clarity and unpretentious style - on occasion neo-diary or letter-home - of the contributors as much as in their detailed recall and perceptions. To identify favourites from this Golden Treasury would be both difficult and invidious, partly because there are so many essays I shall want to go back to and re-read and partly because I find too many Ugandan acquaintances among the contributors to dare to risk bestowing any accolade. But such memorable minutiae as Government House nannies, Cohen's "aggressively rude" treatment (p.l22) of his Private Secretary - indeed, nearly all the behind-the-scene personal glimpses of life and work in Government House and of its successive incumbents - the experiences of the DO who escorted the Kabaka on his flight to London and exile, the wonderment by one disconsolate cadet of why he was in Uganda at all, and the courageous re-opening of the British High Commission in Kampala in 1979, all add measurably to the story as it has so far been - or not been - told. It is a pity there is not more about the critical role of the latterday DO in his involvement in the Africanization of the Administrative Service and in working with African Ministers in one capacity or another. In paying such respect to the compelling, memoir style of the contributors, a reviewer of Looking Back (the very title has undisclosed echoes of the autobiography of a certain colourful inter-war Resident of Buganda) would be at fault if he were not equally to draw attention to the dry-as-dust but worth-its-weight-in-gold Appendix B on the composition, by rank and name, of the Protectorate Administration in 1939 and 1946, along with a complete list of all the DOs who served between 1950 and 1962. The book concludes with a list of British honours earned by post-war administrative officers who served in Uganda before, during and after that service; an industriously compiled summary of events in Ugandan history from 1945 to 1995; and an extensive index. There is no list of maps, but they are there. 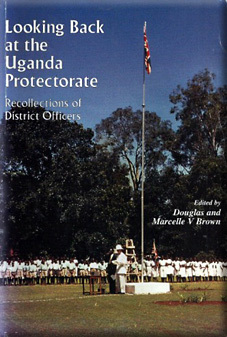 A handful of black and white photographs decorates the text, and the cover photograph is a triumphant illustration of the editor's justifiable conclusion, culminating in the shared sentiment "I was proud to be a District Officer in the Uganda Protectorate" (p.viii). The typesetters and the binder, both located - like the two highly effective but modestly self-effacing editors - in Western Australia, deserve congratulations too. So much for the book, the heart of the matter: a splendid project superbly executed. What, then, of the other theme in this review, the concept and the content of the publication? It may well be that I am pursuing a chimera in hoping to write a history of the District Officer. It is also possible that, despite (maybe because of) years of research, I may have bitten off more than I can chew. Hence my belief that Looking Back not only furnishes a substantial answer to the question of what did the DO do in postwar Uganda. It also provides an example, and in many respects a model, of what is the next necessary stage before attempting to construct a socio-administrative history of the DO in Africa or of the wider Colonial Administrative Service (CAS) or even of that most elusive of all, the Colonial Service/HMOCS. There can be no stronger intellectual fillip and no more constructive contribution towards writing some kind of history of the Colonial Administrative Service than a series of separate territorial CAS sketches. So far we have H. Kuklick (1978) for the Gold Coast, R. Heussler (1981, 1983) for Malaya (and to an extent for Tanganyika (1971) and N. Nigeria (1968)), and C. Chenevix Trench (1993) for Kenya. T. Carter (1992) also has some good material for Nothern Rhodesia. Now we have Brown and Brown for Ugandan DOs. The whole is always made up of its parts, and these some half-dozen studies form an invaluable part of any putative overall history. What, in a sentence, we need now - before it is too late, granted our senescence - are more initiatives a la Brown and Brown. This fascinating 'collection of recollections' is not only a brilliant insight into the work of the post-war District Officer in Uganda at work and often at play (Ch.7). It also represents a major contribution to the record of the Colonial Service, all the more important when the reversion of Hong Kong to China in 1997 seems destined to signal the end of HMOCS. Looking Back is more than an eminently readable record of Uganda's DOs. At the same time it offers a valuable building block towards an ultimate history of the Colonial Service/HMOCS, above all of the Colonial Administrative Service. For the historian who wants to know what the work of that creature from a fast-fading past, the District Officer, was all about. Looking Back offers one of the best, most authentic and most extensive insider's insights since Kenneth Bradley's memorable Diary of a District Officer published more than fifty years ago. Douglas and Marcelle V. Brown.